The AUF1 TA is an upgraded version of the AUF1 T. Its development falls within the scope of the artillery upgrade programme launched by the DGA (French Defence Procurement Agency) for the French Army which focuses on mobility, onboard fire-control system, fire control and maintainability. 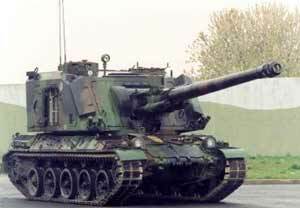 The AUF1 TA turret, for the French Army, is mounted on a refurbished AMX 30 B2-type chassis fitted with a 750 hp Renault/Mack E9 engine. This engine, associated with a semiautomatic gearbox, provides the system with a power-to-weight ratio 20% higher than the original configuration. It gives the system mobility and manÅ“uvrability capabilities that are identical to those of the MBTs.t.